The Bouvier des Ardennes originated as a cattle drover in the Belgian Ardennes. Only the most hard and hardworking dogs from a very restricted population were retained and used to drive the herds, mostly cattle but also sometimes sheep, pigs and horses. They were also used to track deer and wild boar, and during the two World Wars they became poachers’ dogs. During the 20th Century, the disappearance of farms in the Ardennes and the reduction in the herds of milking cattle greatly diminished the number of working dogs, including the Bouvier des Ardennes. Around 1985 a few survivors of this breed were discovered, and some breeders set out to produce dogs that adhered to the original standard of the breed which had been published in 1923. 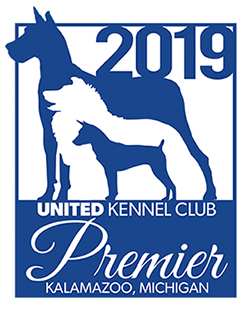 The Bouvier des Ardennes was recognized by the United Kennel Club July 1, 2006. 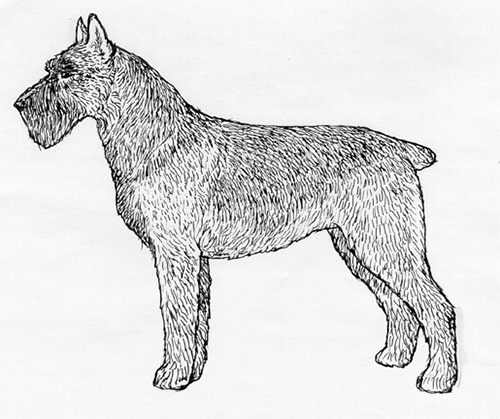 The Bouvier des Ardennes is a medium-sized, very hardy dog of rugged appearance. It is short and thick set, with bone that is heavier than its overall size might suggest. It is compact and well-muscled, with a harsh, tousled coat and a rather forbidding appearance. The breed should be judged in a natural stance, without stacking by the handler. Extremely adaptable, the Bouvier des Ardennes is at ease in any situation. It is playful and curious, yet very obstinate and determined when defending its family, possessions or territory. The head is strong and rather short. The skull is broad and flat, slightly longer overall than wide. There is no occipital protuberance. The stop is pronounced but not excessive, though it is emphasized by the bushy eyebrows. Cheek bones are not prominent. Thick and broad, well filled under the eyes, and clearly shorter than the skull. The toplines of the skull and muzzle lie in parallel planes. The muzzle is furnished with upstanding hair. The muzzle is as broad as the skull, with no indentation at their juncture. The lips are thin and close fitting, with black edges. Disqualification: Lips not completely black. The Bouvier des Ardennes has a complete set of evenly spaced, white teeth meeting in a scissors or level bite. The absence of the first premolars is not a fault. The M3 are not taken into consideration. Disqualifications: Overshot, undershot or wry mouth. Three or more missing teeth, not counting the first premolars or the M3’s. Disqualification: Nose not fully black. Medium in size, set not too far apart, oval in shape, and as dark in color as possible. Eye rims are fully pigmented and no haw should be visible when the dog looks straight ahead. Disqualification: Eye rims not fully pigmented black. Yellow eyes. Triangular in shape, rather small, and set high on the skull. Fully erect ears are preferred, but semi-prick or rose ears are acceptable. Disqualifications: Cropped ears. Drop ears that lie flat against the head. Strong and well muscled, slightly arched and free from throatiness. Shoulder blade and upper arm are reasonably long and thickly muscled. They form an angle of approximately 110 degrees. Straight and strong, with powerful bone. Length of the leg from elbow to ground is approximately one-half the height at the withers. The pasterns are short and strong and slightly sloping. The Bouvier des Ardennes is a square breed, measured from point of shoulder to buttocks and top of withers to ground. The body is powerful, with rounded ribs and a broad, firm back. The chest is deep to the elbows and quite broad. The topline is level all the way through the short, broad loin and croup, to the high set tail. There is little tuck-up. Powerful and moderately angulated. A vertical line drawn from the back of the pelvis should fall just in front of the toes of the back feet. The thighs have prominent muscles. Hocks are broad, sinewy and well let down. Rear pasterns are slightly sloping in profile. Rear dewclaws should be removed. Round and tight with arched toes and thick, dark pads. Thick and high set. Docked or natural are equally acceptable. Some are born naturally bobbed or tailless. Disqualifications: Natural tail carried curled over the back. The coat is dense, double and completely weatherproof. The outer coat is dry, coarse and tousled and about 2½ inches in length all over the body, except on the skull, where it is shorter and flatter. There must be a moustache and beard about 2 inches in length that hides the inside corner of the eye. The outside of the ears is covered by short, straight hair. The undercoat is very dense, regardless of season, and about half the length of the outer coat. The skin is tight fitting, but supple. Disqualification: Any evidence of trimming of the coat. Excessive head furnishings that completely mask the eyes. All colors are acceptable except white. Most generally the color is a mixture of grey, black and fawn hairs. The grey can be from pale to dark. Sometimes the coat is brownish, red or straw colored. A small white spot on the chest and/or toes is acceptable. Disqualifications: Solid white. Any white markings except on the chest and toes. Height at the withers for males is 22-24½ inches. For females, it is 20½ to 22 inches. Weight for males is approximately 60-75 pounds. For females, it is 48-60 pounds. A lively, ground covering trot with strong thrust from the rear. The legs should move in parallel lines with no crabbing. The topline remains firm and level when the dog is in motion. More than one inch over or under the prescribed height limits. Lips, nose or eyerims not fully pigmented in black. Three or more missing teeth, not counting the first premolars or the M3’s. Drop ears that lie flat against the head. Natural tail carried curled over the back. Any evidence of trimming of the coat. Excessive head furnishings that completely mask the eyes. Any white markings except on the chest and toes.